‘Lento’ is a five piece band specialising in creating drawn-out instrumentals which conjure up images of dark and unstable war-torn voids via monstrous riffage, liquid melodies and foreboding ambience. Now, if these elements seem familiar that is because they are and there are hundreds of bands out there concocting a mostly sub-par breed of heavy metal meets post-rock dynamics. It takes a degree of restraint, an expert ability to arrange and manipulate dynamics, and above all, an exquisite touch to make a unique record within this over-burgeoning genre. ‘Lento’ have already displayed their finery with ‘Supernaturals Record One’, a split release with immense epic-rockers UFOmammut and ‘Earthen’ is their full length debut on the classy Italian label, Supernatural Cat. From the outset it is clear that Lento have been listening to one-too-many Pelican records and the opener ‘Hadrons’ is Pelican at their finest. What, with its shimmering guitar melodies lilting over a downtuned barrage of perpetual riffage, ‘Hadrons’ would have made an excellent addition to the fantastic Australasia LP and that is a serious compliment. ‘Need’ is the emotive follow-up which brings into play lusher liquid melodies over a back-drop of crushing and ever-rising riffage to create a score to impending doom whilst allowing room for reminiscing about a life once had. The angular twists and turns, the interplay of the instrumentation, the harmony and progression between soft and loud dynamics are all evident and listeners are left with a wonderful and ravaging sonic war-story. After the dark-ambient soundscape of ‘Subterrestrial’ which gives the listener time to comprehend the heaviness of what just passed, ‘Currents’ erupts with wafts of angelic and harmonised vocal-drones which compliment some shredding concrete riffs to create an awesome (and highly unique) soundscape brimming with thick and sludgy atmospheric ambience. The arrangement of the piece draws the listener ever-deeper into the track resulting in an almost paranoia-inducing, psychedelic affair which leaves you out of breath. Awesome. ‘Emersion of the Island’ moves into the subtle and fuzzy shoe-gazer soundscape of ambient Mogwai with its elongated electroid crackles and pops which wash over the listener in truncated swathes of warm audio-bliss. What follows is a another onslaught of tidal-wave size riffage which staggers on a little lazily in comparison to what has passed before, although the finale is a rather gi-normous beast which will undoubtedly leave your neck sore from all the head-nodding that will inevitably ensue. The final track ‘Leave’ commences with a solemn lullaby which sounds like a score to a bunch of innocent people being marched along a beautiful coast to an ever-nearing execution chamber, a sound which ‘Explosions In the Sky’ managed to craft so realistically. The sound then shifts into a bleak wasteland in which subtle feedback and intimate atmospheric-drone reign supreme. A fitting end to such a powerful album. Overall ‘Earthen’ is a thoroughly impressive debut album which is undoubtedly influenced by the veterans of the heavy post-rock scene. 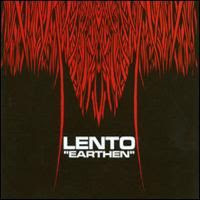 ‘Lento’ have displayed their ability to craft some gigantic and impressive destructo-core which has been made all the more endearing due to the fantastic angular arrangements and the moody atmospherics. With tracks like ‘Currents’, ‘Lento’ showcase their ability to move beyond their influences and a continuation of such ideas will lead to them being the band that influences others.